Note: All early CTMQ posts have small, vertical, rather terrible pictures. Sorry. There comes a time in every person’s life where surprising things become a little bit less surprising. 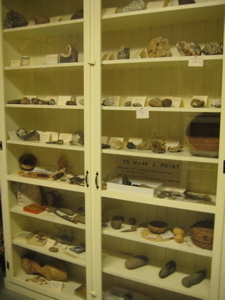 Take, for instance, after going to 73 museums in Connecticut (as most everyone surely has) one stops being overly wowed by a little town history museum that turns out to be quite cool. Even in a town called “Plain”ville. Plainville is plain. Really and truly. It has a Main Street and an Oak Street and a Maple Street within its 12 square miles. People live there, a train rumbles through on occasion and guys drink a few too many in one of the town’s bars. PLAIN. Ville. 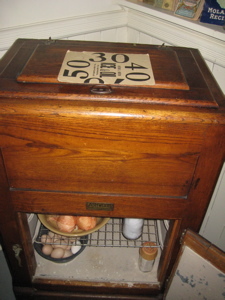 I had to spice up the joint by making it sound French and exciting in my blog title. That is a bold claim, and I like it. I’m too immature to write a caption for this. Plainville rests upon a dividing ridge of watershed, and is the highest bottom-land along the valley. Its measured altitude is 186 feet above tide-water. It is a current geological belief that the Connecticut River formerly flowed through this valley and was at a comparatively late day diverted by some convulsion near Mount Tom, in Massachusetts. Yes, this interests me. And perhaps… Only me. The land was always rather unremarkable, even to the Tunxis Indians way back when. 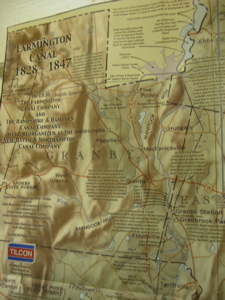 The Plain, as Plainville was known when still part of Farmington, remained of little importance and with no significant business interests until the construction of the Farmington Canal. This remarkable – though ultimately unfortunate work – was an attempt in a small way to bring back the Connecticut River to its original path. The canal was opened in 1826 and between Plainville and New Haven, there were about twenty locks to overcome the elevation change (186 feet). But more on that in a bit. Let’s get going with the museum itself. 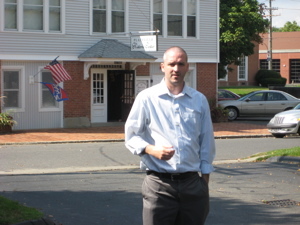 Set right in the center of town, the Plainville Historical Society is located in the old Town Hall. 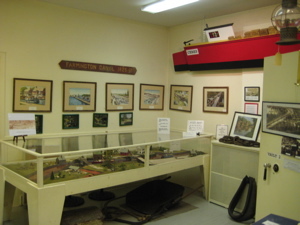 It has been there since the 1976 dedication and is somewhat larger and more interesting than your average town history museum. I was greeted at the door by a very nice woman named Gertrude (I think). Once again I was grilled about my intentions and kindly offered a tour. 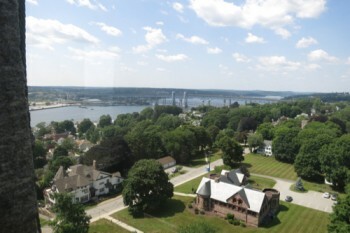 I was led upstairs and immersed into the world of Plainville, Connecticut. A world into which few have delved. Bring it on. This museum pretty good. The first thing I noticed was how pleasantly it smelled and how clean it was. I was told later (upon remarking how lovely the whole building smelled), that they use those plug-in scent release things. Dreamy… and incredibly rare in these settings. 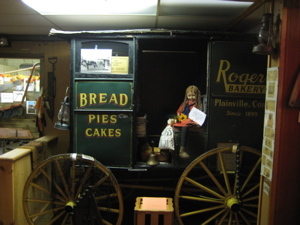 The first few rooms I saw upstairs were typical town museum fare. That’s not to say there weren’t presented well – they were! 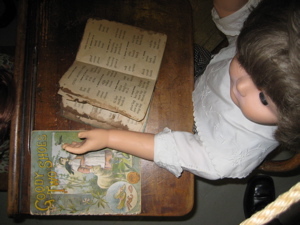 I was distracted, as I always am, by the sheer volume of creepy dolls. 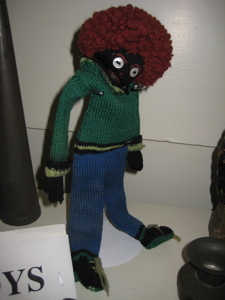 I have been accused of not alerting the readers to the forthcoming creepy doll pictures – so be forewarned, there are many below. First up: the Children’s Room. 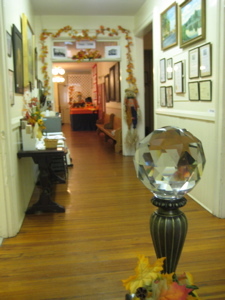 From the PHS website, this room “was the former Assessor’s Office. 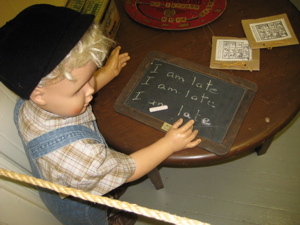 It shows the type of toys children played with in bygone years – a collection of dolls, games, toys and also samples of clothes, some of which date back to the early 1800’s. One of the highlights of the room is a beautiful old dollhouse.” The dollhouse was finished in 1913 and has toy furniture in it from FAO Schwarz in New York City. 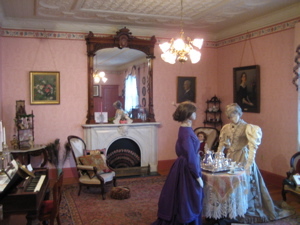 Almost all of the pieces in the dollhouse are originals. 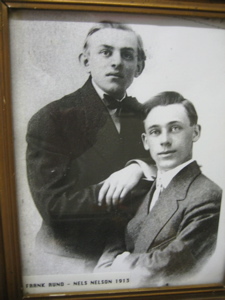 I wrote a note during my visit which says, “doll house; guy on Titanic lived; fam died.” I think I remember that the guy who built the dollhouse by hand survived the Titanic catastrophe but that his whole immediate family died. 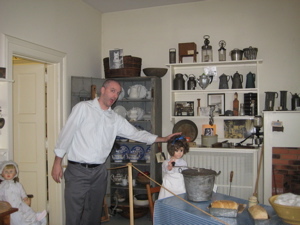 As a result, he had the time and devotion to his nieces for which he built the doll house. Or at least something close to that. 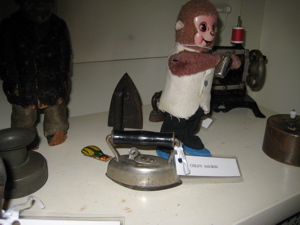 A monkey and a sad iron. I’d think that would make those 19th century women sad indeed. 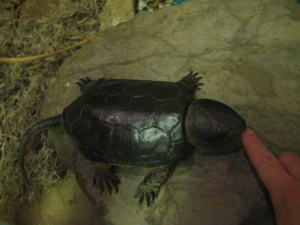 I like to touch them sometimes. A woman named Mary F. Potts endeared herself to countless women when she patented a much lighter sad iron with a detachable wooden handle. Yay! I’m sure her husband took all the credit though. Ahhh, the 19th century had its charms. Across the hall – wait a minute, the hall is pretty cool unto itself. 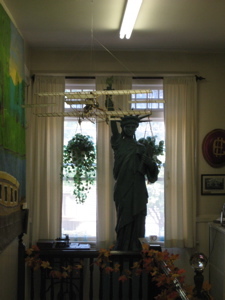 It contains a random Statue of Liberty model for some reason but also a model airplane from the infancy of aviation. It turns out our little Plainville is home to some serious aviation history – on two fronts. 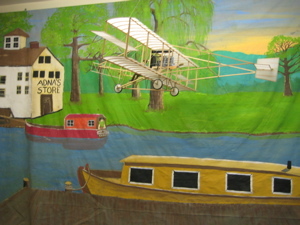 The plane belonged to one Mr. Nels Nelson, who, in 1911 first flew his 33-foot “flying machine” from the Scott Swamp District off of present-day Route 177 in Plainville. He was a daring 22-year-old from New Britain who went on to put on flying exhibitions around the country. Who knew? Also, I learned all about the little local airport, Robertson Field. Opened in 1911, it is the oldest airport in Connecticut! (CTMQ Visit here!) Furthermore, John H. Trumbull, a Plainville native and Connecticut’s Governor from 1925 to 1931, is known to have used the airfield. He was dubbed “The Flying Governor”. My guide told me that Trumbull was actually a terrible pilot who had a habit of bad landings – but somehow never died doing so. 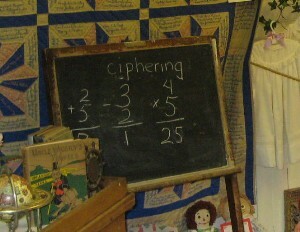 Certainly a unique type of room to have in a town history museum, and one which I thoroughly enjoyed. 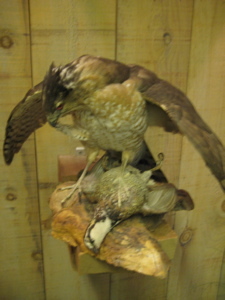 Once again my projeced time for this museum was to be doubled in reality. Oh well. Especially since my favorite room was up next – the Canal Room. The Farmington Canal was a colossal failure, by all measures. On the heels of the completion of the Erie Canal in New York State, a group of New Haven businessmen met in 1821 with the goal of constructing a canal in Connecticut to facilitate trade. Ground was first broken on July 4, 1825. It was completed in 1835. The canal was not cheap to build, and the finances of the construction and upkeep of the canal were always precarious. Railroads put an end to the use of the canal. Just 12 years after the canal was completed, a rail bed was laid to cover the same route the canal had traversed. Whoops. For far, FAR more information on this fascinating and enduring bit of Connecticut history, the the folks at Yale have some great stuff. At the back of the building, The Courtroom that once served the town is now used for summer displays and meetings. Hanging on the walls are a number of Alfred Hepworth’s (1876-1962) paintings. 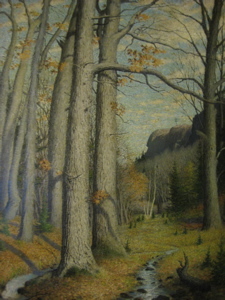 I only mention this because one of the paintings is of The Pinnacle which is along the Metacomet Trail. There’s a ton of cool stuff up there at the edge of town. 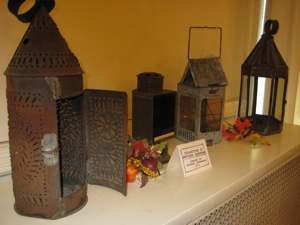 Also in the Court Room: A collection of antique lanterns for some reason. 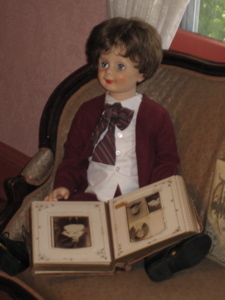 There was, of course, also a few creepy dolls in there but they didn’t take away from the impressiveness of the room. I’m no fan of Victoriana, but this was one of the better presentations I’ve come across. 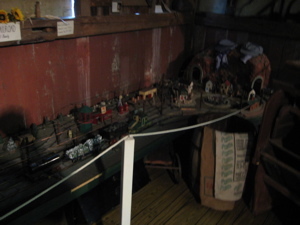 There is also a working antique train display which I was most interested in. 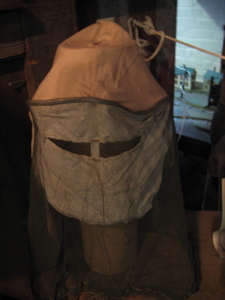 And what museum is complete without an antique bee-keeping mask? Shame on you every other museum in the world for not having one. The last room to check out was the Tool Room. 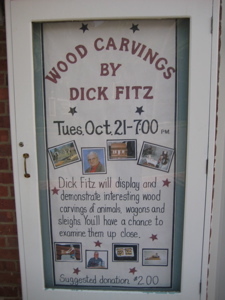 The Tool Room has on display a large collection of woodworking tools, icing tools, and pictures. 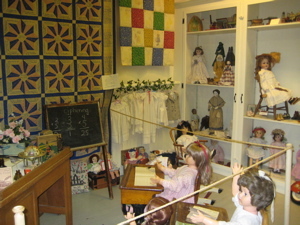 Also on display in that room is basting thread, spools, scissors and undergarments from the Plainville Manufacturing Co. (1850-1930’s) knitting mill. I can’t believe I didn’t get a picture of any old timey undergarments. I’m sure my Google hits would increase with a good shot of something like that. Oh well. I ended my tour with a lengthy chat with a couple women who volunteer at the museum. They were working on the website I used for much of my write-up and were very excited about a new printer. They were also excited to have me visiting and showing an interest in the town’s history – especially since I wasn’t from the town. I was invited on a field trip to the local Tomasso quarry which is now half a mountain across I-84 – here – but that didn’t seem too enjoyable to me. I very much enjoyed this museum. Once again I was blown away by the volume and richness of the Plainville collection. I’m not sure I’ll ever stop being surprised by this stuff. Plainville is not Connecticut’s most interesting town by any stretch and even though I’ve driven through it a few hundred times by now, I learned I knew nothing about it at all. I grew up in P-ville right around the corner from this awesome place. Being the huge nerd that I am, many hours were spent in here and the cool museum in the library. (Did you know about that one?) I love Plainville even if it is a little drunk and whitetrash…lol. I am looking for any information or pictures about Hugh Rockwell’s monoplane, that might have been built at Rockwell-Drake in 1917.